Sometimes after you are done creating tables in Excel, you realize that the columns could be better as rows and vice versa. 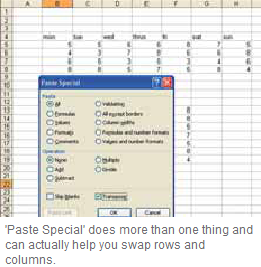 PASTE SPECIAL AND TRANSPOSE: First select the area whose columns and rows you want to swap.Then right-click the selected area and select ‘Copy’ or ‘Cut’, depending on whether you want to entirely replace the table or create a new one while keeping the original. Ensure that the area where you want to insert the table should be the same as the original. Next, right click and select the option ‘Paste Special’. In the dialog box that you see next, select the option Transpose, which you will ﬁnd in the right-hand corner. Select ‘Ok’. Excel will now swap columns and rows.